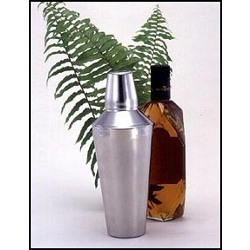 We are highly reputed as trusted manufacturers, suppliers, and exporters of a broad array of Barware and Bar Accessories including Stainless Steel Bar Shaker that is manufactured by using the finest grades of stainless steel that are procured from trusted vendors of the domain. We maintain stringent quality checks at every stage of production. These are elegantly designed and have immaculate finish that offers a professional look. These can be availed at very reasonable rates by our valued patrons. 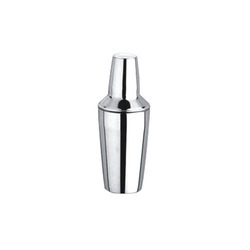 Our rich domain experience of manufacturing, supplying, and exporting a wide assortment of Barware and Bar Accessories has enabled us to offer Stainless Steel Cocktail Shaker (Regular). 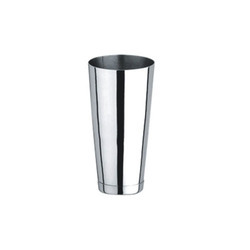 It is designed for easy and efficient cocktail shaking and extensively used in leading bars as well as restaurants. These are made in state of the art manufacturing facilities that are well equipped with modern machines under rigid standards of quality by adhering to preset industry protocols. 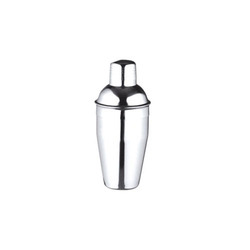 We are engaged in manufacturing, supplying, and exporting a wide assortment of Barware and Bar Accessories such as Stainless Steel Cocktail Shaker (Deluxe). It is used extensively for easy and homogeneous cocktail shaking and widely used in leading hotel establishments as well as bars. These are manufactured in modern manufacturing facilities that are well equipped with state of the art machines under stringent of quality by adhering to preset industry protocols. Cocktail Shaker provided by us is used to mix beverages (usually alcoholic) by shaking. When ice is put in the shaker this allows for a quicker cooling of the drink before serving.